A rebuttal to the story which appeared in the Zionist journal Newsmax in which American Muslims have been targeted, misrepresented and subjected to the worst kind of misinformation, leading to a rise of hate campaigns and Islamophobia. We Muslims know that we cannot stop the hate campaign against Muslims because the enemy of Islam believes that Muslims have become a danger to their existence. We know these enemies are trying to bring about a clash between Muslims and Christians, but that will not happen. We have read the article written by Donna Gehrke-White and Tim Collie, published in Newsmax Magazine, November, 2010, and found it most misleading and incoherent, written by those who do not know much about Islam. The only thing that is evident from this article is that it is the work of one of the hundreds of hate groups which are trying to bring about a clash between Muslims and Christians. It is the cover up of the hatred felt for American Muslims, be they indigenous or settlers. From the piece, which was unfortunately published, it would seem that only Europeans have the right to freedom or to live freely in the United States. The writers dare to declare America as following a “Judeo-Christian heritage” and claim that the rising of Islam will jeopardize this heritage. First of all, what is Judeo-Christian heritage? We are sure that Ms. Gehrke-White and Mr. Collie have no explanation because in western countries, it is Greek mythology and Roman Paganism that is followed, not Judeo-Christian Heritage. This is clear from the architecture, the mannerisms, the customs, and the lifestyle of the people. His Eminence elaborates: On the contrary, Muslims have a divinely codified way of life, termed ‘Deen’ in the original Arabic. Deen is Islamic culture; and sharia, which is law, is part of it. Therefore, let us examine the indigenous Muslims in America, one prime example being the community of The Muslims of the Americas, who are spread throughout the country. They reside within their own housing schemes, living under their own heads of community who practise Islam in letter and spirit. These officials do not enforce hudood as described in the article, but follow sharia discipline. Sharia is a divine code of law based on morality, principles, rules and conduct laid down in the Torah, the teachings of Jesus son of Mary, and the teachings by the Holy Last Messenger (peace be upon them). The source of Sharia is The Ten Commandments. This, then is sharia properlydefined, making it plainly evident as to what is the true Judeo/Christian/Islamic heritage. Please show us the Christian groups or denominations that follow the teachings of Jesus, son of Mary, and the laws he brought, and those he followed–in letter and spirit? He followed the Ten Commandments, which are violated openly in today’s society. The article quotes some Iranian Shiites who oppose sharia because they have their own law and don’t believe in sharia. They have their own religion which is separate from Islam. Our Imam explains: The tenets of their religion include practices diametrically opposed to sharia such as ‘taqia’, mutta (temporary) marriage and hurling abuses and slanderous remarks about Hazrat Abu Bakr Siddique and Hazrat Omar Farooq, who were holy companions of the Holy Last Messenger (peace upon him). Taqia is to conceal facts and say things contrary to what is in the heart. Gehrke-White and Collie chose to quote remarks by people who do not allow mosques to be built in their country, Iran, and where no one prays five times a day as prescribed by Islamic law. Is this article considered journalism? Or is the goal to add fuel to an already raging fire, fed by misconceptions, misinformation, and misinterpretations? To quote a well-known western author, “The public easily confuses him who fishes in troubled waters with him who draws up water from the depths.” By now, many should have opened their hearts and opened their eyes. The timeline in the article erroneously indicates that 30% of the ten million Africans who were brought over as slaves were Muslims. The fact is, 70% of the Africans who were brought over as slaves were Muslims. These Muslims built the United States of America with their own hands, sweat and blood. They were the true pioneers who made America what it is today. Why no mention of them? Why don’t the authors expose the crimes which were committed against these people? They were dehumanised, persecuted and treated worse than animals. Find one instance in the entire Islamic history that people were treated like that. Under which law were these horrendous crimes committed against humanity? We join with our Imam to enlighten you with historical facts, the truth behind current events and some basic knowledge of Islam. The concept of slavery was demolished with the coming of Islam when the Holy Last Messenger, peace upon him, came with the tenets of Islam that included a system of equality. Legally, the Holy Last Messenger, peace upon him, quietly abolished slavery by introducing divine laws that made slaves equal in every aspect to their masters until there could be no distinction between slave and master. In the great annals of Islamic history, there were slave dynasties and slave kings like the Mamluks of Egypt, and the Aybaks in India. The word ‘slave’ does not exist in Islam. Let us remind you about the American tradition, and put the record straight. This country belonged to the real native Americans, known as “Indians” because an ignorant European thought he landed in India when he reached the shores of America. Therefore, none of you settlers follow the real American tradition. The natives were brave, generous and believed in One Great Spirit in the Heavens. They raised their families with morality and did not commit adultery or perversions. Your forefathers, the so-called “first” settlers, whose tradition you follow even now, perpetrated one unforgettable and unforgivable crime against humanity; that is, they committed genocide of the real Americans, destroyed their culture and eliminated millions of them, their buffalo and their way of life- with many of their tribes being exterminated totally. Yet you dare to tell the world that you follow Judeo-Christian heritage. What you follow is paganism. Like a bat, you cannot see the light. You can only see darkness. Neither do you have any knowledge, nor do you have the will to acquire the knowledge. You fan the flames of Islamophobia with your lies and false accusations. But it is only harming you and your people, no-one else. The writing is on the wall. You may be settlers, but we are not. We are descendants of Muslim scholars from Africa- Senegal, Mali, the Gold Coast, now known as Ghana, and the Ivory Coast of West Africa. You are the descendants of criminals who were banished to the Americas from Europe. You quote in your article that “fundamentalist Islam is incompatible with numerous U.S. constitutional freedoms…”. You complain that Muslims come here and do not follow American traditions; what are American traditions? That we become gay and lesbian and allow our daughters to commit adultery? What is American Culture as it exists today? Look in the mirror, there is no culture in America, nor so-called Judeo-Christian heritage. Everyone does as he/she likes; paganism is rampant. It is a culture of oppression and cruelty, perversion and murder of innocent people. As a matter of fact, when you look in the mirror, you see your ugly face and brazenly attribute its ugliness to the Muslims. It is very unfortunate to see wrath after wrath falling on the American people. These are reminders from the Almighty God of Abraham, Moses, Jacob, Jesus son of Mary and the Holy Last Messenger (peace upon him). You talk about home grown terror in your assertion of a, “…troubling pattern to some experts who believe that fundamentalist Islam is taking root in America and encouraging a new generation of homegrown terrorists…”. We ask, what of 1993 when the Mossad and the FBI set up an operation to turn the American government agencies against Muslims, by planning an attack on the World Trade Center and using ignorant Muslims to carry out their conspiracy? It is a well documented fact, in which agency officials admitted to this crime. Is this not home grown terror at its climax? Since you have chosen to cut such a wide swath by opening your mouth, these questions also demand an answer. Tell us, what law compels the U.S. to launch attacks by drones in bombing campaigns, in Afghanistan and elsewhere? These people use remote control drones to bomb innocent men, women and children in the Pak/Afghan border area; for what crime? What have they done? Is it consistent with the U.S. constitution to destroy and invade other countries and kill their innocent citizens? If you don’t believe in God, then you have also forgotten the Founding Fathers; at least you should heed Benjamin Franklin when he says, “whatever you sow, you shall reap”. It is very clear that whatever you sow in Afghanistan, so shall you reap the harvest in the United States. We have been cautioning the government, through The Islamic Post and through our other print and electronic media, not to oppress other sovereign nations because the immutable law of Almighty God does not spare the transgressors. He always punishes them. Look at the fate of Pharaoh and Nimrod and the gays of Sodom and Gomorrah. One must not forget how the Almighty gripped them, and they met with severe punishment for their evil deeds. In regards to Faizal Shezad, the supposed Times Square bomber, it is a well documented fact that he was set up by secret service people who supplied the materials and vehicle for the failed attempt. These are very well known tactics of the Mossad and their friendly agencies. If the writers and publishers of the article under examination do not know this, they should read books such as Stranger than Fiction or By Way of Deception. Do some research and reading and then dare to pick up the pen, instead of spilling lies and false accusations on innocent people. Once and for all, we the American Muslims wish to make it clear that America does not belong to any one ethnic or religious group, but is a world in its own right, belonging to all who live here. Arabs, Jews, Hispanics, Chinese, Muslims -all must be able to live freely, without any infringement upon their religious and other rights. Let everyone practise his own religion of choice, independently. Since the United States is not an Islamic state, hudood cannot be enforced; only ‘tazirat’ (disciplinary action) can be taken by heads of Muslim communities. This is not unusual. Christians do the same in their church communities. However, if any American Muslim should commit murder, theft, etc., he/she must face consequences under the American judicial system. Conclusively, we, American Muslims have been indigenous to these shores for centuries. Arab traders were in America before Columbus. They brought grapes, date palms and olives to the “Land of the Khalifa” now known as “Calif”-ornia. This is verified by the inscriptions on old tombstones and remains of old Masjids built there, before Columbus. Our position is different from immigrant Muslims: As a rule, Muslims are not allowed to leave Islamic countries and settle down in un-Islamic countries unless they go there for trade, ambassadorial duties, missionary work, etc. All Muslims who have migrated to live in Western countries are under obligation to return to their country of origin. 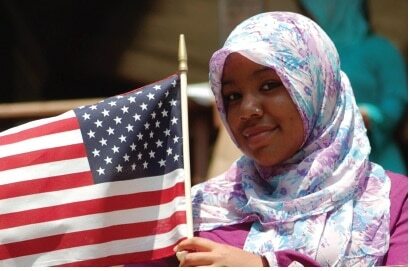 However, we are indigenous American Muslims and the United States is our only home. As such, we have no choice but to use our own newspapers, journals, and Islamic Cable Network to rebut false accusations and propaganda against Muslims in America. For your information, we are a different breed of American youth who fully understand the conspiracies hatched by the enemies of our country. The world has changed; so have we. You can no longer fool the world or American Muslims anymore. In the future, when you write such lies, think twice. Significantly, as a religion, Islam is the majority religion in America. Churches are practically empty. Mosques are full five times a day. There are more practicing Muslims in America than any other religion, and they love the USA and will defend it against and in spite of all odds. While writers such as yourselves attack American Muslims endeavoring to live at peace with their neighbors, there’s no check on extremist Wahabi elements who consider all other Muslims as heretics and sanction their killings. Anyone who doesn’t follow the doctrine of Ibn Wahab, they kill. However, they have nothing to do with Islam. They even tried to destroy the Tomb of the Holy Last Messenger (peace upon him). In Saudi Arabia, Muslims cannot hold parades on the Birthday of the Holy last messenger (peace be upon him) the way we do in America. This should be an eye opener for you. Still, in the final event, it seems all explanations are to no avail because the hate campaign in America has reached its climax, and not only American Muslims, but Muslims the world over, are victims of media terrorism. It is ironic that all the ugly deeds of murder, torture and inhumane treatment of innocent civilians meted out to Iraqis at Abu Ghraib and torture camps like Guantanamo Bay are never taken as acts of terrorism. It bears repeating that after 9/11, one hundred American Muslim Scouts were present for rescue and relief; they, along with many Americans were shocked to find out that 4,000 Jews were not present when the incident took place. Questions surfaced. How did building number seven collapse without any airplane hitting it? Did Osama or Khalid Sheikh do it? Who stayed procedural defensive action by NORAD (North American Aerospace Defence Command) for 45 minutes? The answers point to home-grown terrorism, by anti-Americans who wish to effect a clash of civilizations; who wish to realize their Kingdom of David or New World Order, for which American blood and resources are being exploited mercilessly, in fighting a war in proxy, for Israel. What did we Americans get out of going to war in Iraq? We had no cause to go to war except that Iraq had become a threat to Israel. No-one found Weapons of Mass Destruction – yet the Zionist-controlled media pushed the United States into war. It is a bitter pill to swallow. What they have done to American blood and money, in Iraq, for the sake of Israel, is horrendous. Through false propaganda, Fox News convinced the world that Iraq had weapons of mass destruction. We ask: What had the Iraqi people done? Despite the declaration of the United Nations inspectors who officially declared that there were no WMD in Iraq, the Zionist media like Fox and others pushed America into declaring war on Iraq because Israel thought Iraq was a risk to its existence. The result is that Israel becomes stronger and acquires a stronger grip on America causing USA to suffer from loss in business, economics and mysterious diseases. American citizens are now poorer than they were before the Iraq campaign, and now the Afghan campaign will bring more disastrous results for American citizens. We, American citizens are very much concerned about our country. We observe what is happening, and we know who is behind it. Media terrorism’s job, of which your article is a fine example, is to fan hatred between Muslims and Christian. However, the facts are quite different to the opposition you seek to encourage. Ever since Almighty God revealed law in shape of the Ten Commandments, there has been a codified system of law for mankind to follow. In The Old Testament, it has been declared, “ an eye for an eye and tooth for tooth”. All such crimes such as “thou shalt not kill, commit adultery, steal, tell lies”, are mentioned in the Ten Commandments and were codified with a punishment prescribed for each crime. That actually is Islamic Law. This information should increase your knowledge. We know that writers of your ilk are all extremist Zionists, but you have nothing to do with the Torah, which was a light of Guidance from God. You talk of Judeo-Christian Heritage? Tell me, where does Judeo-Christian heritage allow you to torture innocent people, make them naked and force them to commit adultery with each other or throw them naked before dogs? Much more than this happened at Abu Ghraib and the Guantanamo Bay slaughter houses where people were rounded up like cattle on mere suspicion, and tortured. Why don’t you enlighten people, according to which law these people were tortured and murdered, in cold blood? We American Muslims, through our newspaper, would like the American public and the world to know that we are no more slaves, nor oppressed. We know our rights and what happened to our ancestors. We will defend our religious freedom and our country that we built. Today, not only media terrorism, but disinformation and blackmailing are the order of the day. The fear is that if this media terrorism and hate campaign is allowed to grow, the U.S. is going to suffer exceedingly. There is much more that we can add to this document. Basically, however, we want to open your eyes and heart and show you the right direction. Christians have their head or Pope. American Muslims have their Imam, El Sheikh Syed Mubarik Ali Shah Gilani, who is very well known. When he came to know of the hate campaign being fanned by Zionist-backed groups such as CAN (so-called ‘Christian Action Network’), he instructed us to join hands immediately, with Christians because Allah says in Holy Quran that the followers of Jesus, son of Mary, are closer to Muslims than any other community. Therefore, we formed the United Muslim Christian Forum (UMCF), held parades and rallies and joined hands with our Christian brethren to avoid any clash that papers such as yours are working towards day and night. Both Muslims and Christians, join hands and celebrate the births of Jesus, son of Mary and the Holy Last Messenger (peace be upon them). Our mutual cooperation and understanding is growing day by day, and worldwide. We assure you and other groups, that you will fail miserably in bringing about a clash between Muslims and Christians. On the contrary, the real enemies of America are being exposed, and we fully agree with Colonel Donn de Grand Pre where he identifies the real enemy of the American people: “We have become so accustomed to being under siege by the enemy within that we don’t realize that we are in fact in a war to the death. And we are losing… not only the war, but our country. We now must define that enemy within, his history, his tactics and his techniques, chief among them being mass manipulation, coupled to physical and psychological acts of terror. The enemy within now dominates six of the seven M’s – Money, Media, Markets, Medical, Mind, Morals. He desperately needs the seventh M – Muscle – embodied in our military and its primary function, to defend the Constitution of the United States of America against all enemies, foreign and domestic.” – (Ch 1, Pg 1, “Barbarians Inside the Gates”) We American Muslims follow true Judeo-Christian-Islamic tradition whose motto is “mankind is the family of God”. We make no distinction, rather we help all humanity alike. This is why we went out of our way to help the victims of the New Orleans disaster, 9/11 tragedy, Northern Pakistan earthquake and the floods in upstate New York. In the same spirit, we staged rallies in front of the White House to protest the atrocities in Kashmir by Indian and Israeli commandos, and we established the Kashmiri American Friendship Society. Nevertheless, we make things clear to this journal and their other allies like CAN and all those who are fanning hatred for Islam and churning Islamophobia. Islam was here before Columbus. Like Christianity, Islam is part and parcel of American society. Do what you may, you cannot eliminate Islam and Muslims from American society. We were not shocked when a group like yours, namely CAN accused our university and community of having underground bunkers, airstrip and WMD, on our rural properties. It is our duty to expose spurious news reporting, but thankfully, all journalism is not like Newsmax. The late George Crile of CBS went all the way from U.S. to Pakistan to expose the innocent killing of people by American missiles in Afghanistan, and he made a video which was shown by his TV network. He was a good Christian full of mercy in his heart and love for humanity at large. He has passed on and we are still waiting for someone like him to measure up to his genuine reporting. Furthermore, thank God one independent TV network, Al Arabiya carried out an investigation on their own and exposed the false accusations and blatant lies against Muslims in America, again intended to generate Islamophobia. These unending lies and intrigues started from the time of Jesus son of Mary when they declared him a terrorist and told the Romans he was a rebel and enemy of the state, in order to have him crucified. Instead their own spy, Judas was crucified. Almighty changed Judas’ face to the likeness of Jesus, and Jesus was lifted up alive, and will soon come down to settle the score, and join Islam and Christianity into one religion. Esoterically, amongst Sufis, it is very common to see him and meet him. Our Imam has also enabled some of us to meet the promised Mahdi about whose coming he said would be soon, when all the Jews of the world would come together in one country. Finally, we, American Muslims are considering a plan to initiate a program called “Save America” for exposing anti-American policies, and intrigues, and conspiracies, which have also been amply exposed by Col. Donn De Grand Pre in his famous three books, as well as by former congressman Paul Findley and others. Above, Razia A. Muqit displays her patriotism at an annual interfaith parade held in the U.S.;; while Newsmax’s fallacious report (publication cover below) serves as a stark contrast with reality for millions of American Muslims.